Elite athletes at the 2019 Tata Mumbai Marathon (TMM). Photo: by arrangement. 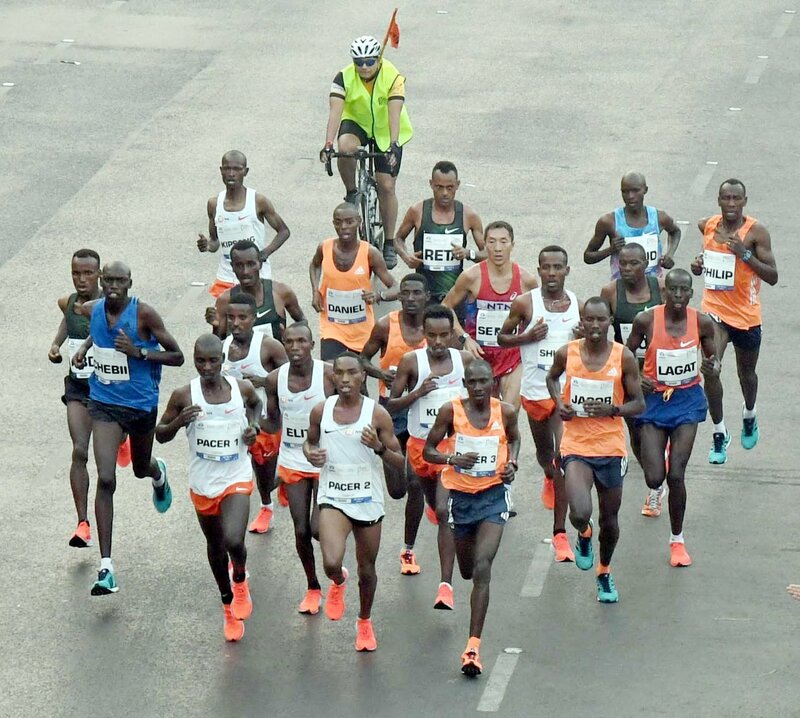 Cosmas Lagat of Kenya who won the men’s full marathon was sole exception in an otherwise Ethiopian sweep of podium positions at the 2019 Tata Mumbai Marathon (TMM), held on Sunday January 20. The women’s segment of the full marathon was won by Ethiopia’s Worknesh Alemu. Lagat covered the distance in two hours, nine minutes and 15 seconds while Alemu clocked 2:25:45. According to the race report available on the website of the International Association of Athletics Federations (IAAF), both the above mentioned timings were the second fastest in their respective categories in the event’s history. The two winners took home cheques of $ 45,000. Aychew Bantie of Ethiopia finished second in the men’s full marathon (2:10:05) followed by fellow countryman Shumet Akalnew (2:10:14). In the women’s category the second position was bagged by Ethiopia’s Amane Gobena (2:26:09) while the third place went to Birke Debele (2:26:39), also of Ethiopia. Over 46,000 people had registered to take part in the 2019 TMM. According to one media report, this included 8414 runners in the full marathon, 15,457 in the half marathon and 2516 in the timed 10K run. Much against the prayers of many a runner, race day this year proved to be quite warm resulting in several cases of dehydration. From the ranks of Indian elite athletes, Sudha Singh’s performance was particularly lauded. Defending champion, she won the full marathon in the Indian women’s category in a new personal best and new course record of 2:34:56, which is also the second best timing returned by an Indian woman in the discipline yet. It is just 13 seconds slower than the current national record held by O.P Jaisha. Sudha Singh’s run at 2019 TMM was characterized by a relatively slow first half – which some feel may have cost her still better timing – and a dramatic negative split afterwards. In the full marathon, second place among Indian women went to Jyoti Gawte (2:45:48) while the third place was secured by Jigmet Dolma (3:10:43). Among Indian men, Nitendra Singh Rawat took the top position, completing the full marathon in 2:15:52, four seconds short of his own course record in Mumbai. Defending champion, T. Gopi had to settle for second place; he covered the distance in 2:17:03. Karan Singh placed third with a timing of 2:20:10. Given their timing at 2019 TMM, both Sudha Singh and Nitendra Singh Rawat have qualified for the IAAF World Championships to be held later this year in Qatar. The qualifying time for men was 2:16.00 and that for women, 2:37:00. In the half marathon, the men’s category was won by Srinu Bugatha (1:05:48) followed by Shankar Man Thapa (1:06:04) and Kalidas Hirave (1:06:36). The women’s category was won by Meenu (1:18:02) followed by Saigeeta Naik (1:18:58) and Manju Yadav (1:25:09). In the 10K run, the men’s segment was topped by Hemant Limbu (00:35:17); Sandip Chaudhari (00:36:30) placed second while Vidyanand Yadav (00:37:37) placed third. The women’s category was won by Rupa Jaiswar (00:44:33) followed by Devika Srikanth (00:44:52) and Amirah Miller (00:47:58).